The one awful feature of MLB.tv is their often absurd blackout rules. During Spring Training, however, you don’t have to worry about it because there are no blackout restrictions. (What a novel concept). Not every Spring Training game is broadcast on TV, but MLB.tv will deliver over 200 Spring Training games. There are two different subscription options, the standard MLB.tv subscription runs $109.99 for the entire season. 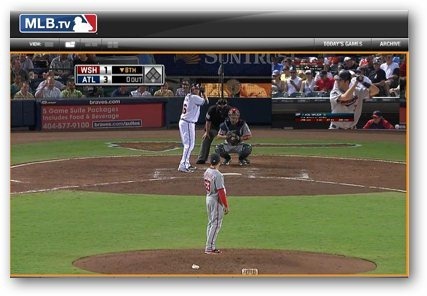 MLB.tv Premium is $129.99 for the year and gives you a choice between Home or Away broadcast, Live Game DVR controls, and Multi-Game view with Picture in Picture, Split screen, or Quad view. Beginning this season, Premium subscribers only will get free access to MLB At Bat app and the ability to watch on a variety of connected devices like PS3, Xbox 360, Roku, and more. The Premium version of MLB.tv comes with FREE access to the MLB At Bat 14 app for your mobile devices (iPhone, iPad, Android), plus the ability to watch on other internet connect devices like the Xbox 360, PS3, Apple TV, Roku, Boxee, and select devices from Panasonic, Samsung, LG. If you are ready to dive in and try MLB.tv for yourself, you can sign up for MLB.tv here at MLB.com.